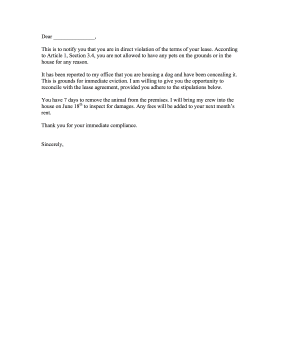 Landlords can use this printable complaint letter to report tenants who violate their leases. This is to notify you that you are in direct violation of the terms of your lease. According to Article 1, Section 3.4, you are not allowed to have any pets on the grounds or in the house for any reason. It has been reported to my office that you are housing a dog and have been concealing it. This is grounds for immediate eviction. I am willing to give you the opportunity to reconcile with the lease agreement, provided you adhere to the stipulations below. You have 7 days to remove the animal from the premises. I will bring my crew into the house on June 18th to inspect for damages. Any fees will be added to your next month's rent. Thank you for your immediate compliance. This Letter of Complaint is easy to download and print. Just download one, open it in Acrobat Reader, and print. Also available: more free printables including hardship Letters, printable stationeries and letterhead templates. If you don't see a complaint letter or category that you want, please take a moment to let us know what you are looking for.